Which international space is your favorite? Whether you enjoy pulling inspiration for your own globally inspired space or simply like indulging in a bit of voyeurism, there’s something about comparing styles from around the world that feels like an insight into the cultures themselves. Every country has its unique characteristics, color palettes, and staple fabrics—some hailing from traditional crafting techniques, others a result of the landscape and climate—that consistently make appearances in the regions’ interior design. That said, it’s not fair (or journalistically accurate) to relegate an entire geographical area full of diverse people and differing design preferences to one specific aesthetic. Just look at California—as equally known for its breezy, whitewashed bohemian styles as it is for its cool, urban contemporary spaces. So instead, we pulled together an array of various spaces from different countries worldwide; specifically, kitchens from around the world. The heart of the home and one of the most-frequented rooms in any house or apartment, the kitchen is one place we find ourselves most drawn to for sourcing design inspiration. If you’re the same, here’s all the global kitchen inspo you’ll ever need. Read on and find the style that most appeals to you. Despite being located in an uber historic part of the world, Tel Aviv is also incredibly vibrant and contemporary. This kitchen, located in a 1,300-square-foot condo, reflects that. Between the cool fuchsia pink bulb pendants (one of our favorite trending statement light ideas) and the cobalt blue cabinets (inspired by Frida Kahlo), the lively space is anything but boring. We especially love the more modern elements juxtaposed with some older accent pieces, like the clay pots and vases on display. The very definition of warm, natural design, this wooden kitchen takes monochrome to the next level—even the beautiful dinnerware, visible thanks to open shelving is washed in a similar earthy caramel color. The natural materials used in this home are directly influenced by the fact that it’s situated in the middle of a forest; the architects pulled brick and wood from the home’s surroundings to build a home that’s truly one with the region. Sometimes, awkwardly shaped rooms don’t have to be bad news: Take note of this tiny home in Calgary to see just how to hack your small space. Skylights inserted into the slanted ceiling bring in extra light that in turn opens up the kitchen even more. Recessed shelving is a clever solution to a lack of cabinet and surface space. The home itself is a historical one, with the designers working to infuse modern, smart design solutions (like the kitchen!) while also preserving the feel of the original space. Love quintessential mediterranean style? Nowhere is it more evident than in the south of Italy, in the region of Puglia. The “heel of Italy’s boot” is sunny, seaside, and heavily features materials like terracotta tiles or clay. As such, you’ll find spacious kitchens—the only thing better than Italian design is Italian food, obviously—full of rustic materials and naturally derived colors. The stone sink is a unique touch that pulls everything all together. This minimalist Shanghai home is a design feat as a whole (seriously, you need to see what it looked like before), but of special note is the kitchen. Neatly tucked away in a nook under the stairs, there’s nothing superfluous; yet it somehow manages to make utilitarian look stylish. This is due to the clean wooden cabinetry and strict adherence to a minimalist aesthetic. It ensures that what little color is present—the raspberry red paper towel dispenser, the blue staircase—doesn’t overwhelm the tiny space. Everything you love about rustic french country design in one space. This kitchen belongs to a B&B in the south of France named La Belle Vue. We love the idea of scouring an antique market for a one-of-a-kind farmhouse table to replace a standard kitchen island; and for wall decor, why not marry function with fashion and hang up your favorite copper pots and pans? A smattering of pendant lights finish off this dreamy kitchen, which we think is reason enough to book a holiday. Anyone who’s ever been to Barcelona probably fell in love with the colorful, lively city within an hour of landing. This blue-tinted kitchen exhibits the best of the city’s style: It’s playful, a tiny bit edgy, and completely unpretentious. Slate black cabinet fronts balance out the punchier pops of color and pattern, grounding the kitchen in a bit of simplicity. Bali is a must-see for every kind of traveler, and if you go you should definitely stay at The Island Houses (or at least, add the rooms to your Pinterest travel board). The Pandan house features this gorgeous pink kitchen, which we love for all the little finishing touches that pay homage to the boutique hotel’s region. One design idea we’re stealing? Mixing and matching pendant lights; the eclectic, yet collected is so much more interesting than a line up of uniform brass fixtures. Designer Claire Rendall’s country home in Bath is a mix of comfort and sophistication, and her kitchen is everything we love about British design. The timeless elegance feels fresh with cool, contemporary additions like acrylic dining chairs—more juxtaposition takes place when you consider the old Indian timber pillars against the white glass tabletop. And the ultimate British design piece may just be the fruit bowl—it belonged to David Bowie. This mini kitchen, situated underneath a lofted bedroom, is Scandi simplicity at its finest. If you live in cramped quarters with a lofted bedroom, take a note from the Swedes and invest some time in turning your home into a warm but minimalist retreat to take full advantage of what square footage you do have. Uniformly white appliances and cabinets allow the wooden accents to really pop. When your floors are a cool concrete, a little throw rug is all that’s needed to finish off the room. Comprised of simple yet stylish little vignettes, this colorful kitchen is a pastel-filled dream. With ample space in which to display both functional kitchenware and decorative trinkets, it’s the perfect place to spend a morning enjoying coffee or an afternoon baking some delicious German confection. 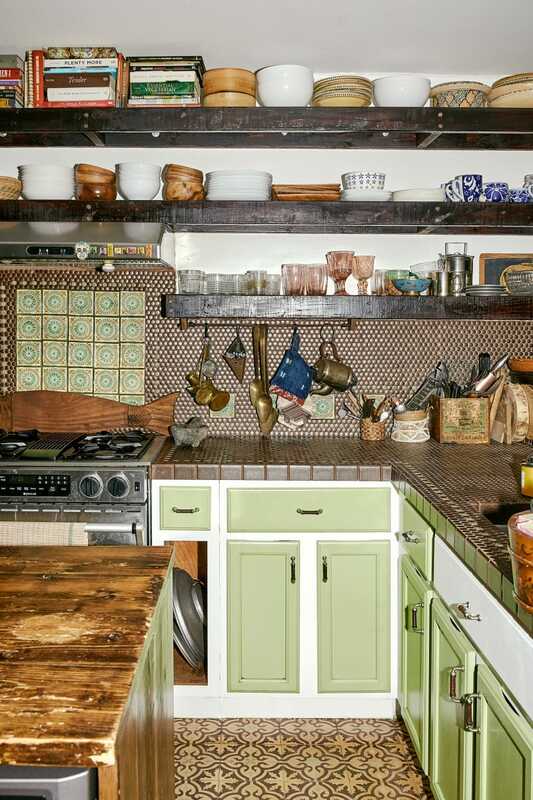 It’s worth noting the dedication to a color scheme: Even the slightly retro tile backsplash matches the same hues exhibited in the decor. As for the example of an American kitchen, this one ticks all the boxes: Navy blue cabinets? Check. Subway tiling? Check. Brassy light fixtures? Check. Open shelving? Check. It’s the perfect pictoral illustration of all our favorite and most-reported on kitchen trends—and with all the natural light and ample space, you’d never guess this room used to be a closet. Here’s a Nordic country we should be paying more attention to in terms of lustworthy interiors: Finland, the home of design house Marimekko and famous architect Alvar Aalto, to name drop a couple noteworthy reasons. And with kitchens like this, it seems there’s much Scandinavian minimalist inspiration to be found within the Baltic country. A clean, whitewashed backdrop allows for every single colorful, interesting kitchen tool to pop, be it the pink mugs on display in the shelves or the matte black faucet. Situated in the historical Medina of Asilah in Morocco, this rustic-looking kitchen may not be what you first think of when you think of stereotypical “Moroccan” design—there’s not a loud pattern or super-saturated hue to be seen—but if anything, that’s proof of just how diverse the city is. We’re loving the wooden accents (they even make a dish drying rack look chic) and the fabric covers in place of regular cabinet doors. The best part? This kitchen is actually part of an equally gorgeous home currently available to rent via Airbnb. It may just be time to book your next vacation.